Heathrow, which enjoyed 4 nights of BBC programmes this week on “Airport Live” giving hours of free publicity, has had a new report published. This is called “Heathrow: Best placed for Britain” (by AECOM and Quod) and its purpose is to set out Heathrow’s case that it is far better value to the UK economy and the UK taxpayer to expand Heathrow rather than to build a brand new airport in the Thames Estuary, or expand Stansted. Also that the UK must have one huge hub airport, and no other solution will do, as the airlines will only make enough profit by using the hub. Heathrow does admit that the taxpayer will have to contribute funds for expansion plans involving at least one new runway. However, it is coy on the matter and gives no indication of how much. The report says: “Financing additional capacity at Heathrow entirely from the private sector will be challenging and will need an appropriate investment framework. The recent difficulties in securing investment for new UK nuclear power stations are a reminder of the difficulty in securing commercial finance for major infrastructure projects without an attractive and stable return.” Heathrow makes out that rejection of its proposals could consign a generation to economic stagnation. Heathrow has admitted that the taxpayer may have to contribute funds for expansion plans that would mean at least one extra runway at Britain’s largest airport and hundreds more flights over London daily. But the airport said a rejection of its proposals could consign a generation to economic stagnation. Heathrow said it was still considering its options before the deadline of 19 July for submissions to the government-appointed airports commission, but indicated that schemes for three or four-runway models could be put forward. It said that competing with rival hubs such as Amsterdam’s Schiphol and Madrid would require having similar capacity of up to 800,000 flights a year, which would equate to a daily average of about 2,000 takeoffs and landings, compared with 1,288 at Heathrow in 2012. John Holland-Kaye, Heathrow’s development director, said the airport “couldn’t rule out” public funding for its plans, depending on the findings of the commission. The airport has previously been keen to stress that expansion would be paid for by private investment. But Holland-Kaye said it would still be cheaper than alternatives at Stansted in Essex or the Thames estuary. “It’s fairly intuitive that there would be greater need for taxpayer support going east,” he said. The London mayor, Boris Johnson, has put the bill for a new hub at £70-80bn, including public funding of £25bn. A Heathrow report titled Best Placed for Britain noted that 202 of the UK’s top 300 companies had headquarters within 25 miles of its site, compared to seven for Stansted and two for a possible Thames estuary airport. It said twice as many people lived within an hour’s journey of Heathrow, whether by car or public transport. Heathrow warned against assuming that the jobs it sustained could be easily transplanted or that the site would quickly be regenerated if the airport was replaced. It pointed to the decades that elapsed while even prime central London locations such as Battersea and Bankside power stations lay unused, while Hong Kong airport is yet to be redeveloped after 15 years. Expanding Heathrow would be cheaper, quicker and better for the economy than creating a new hub airport, according to a report from Heathrow bosses. Adding capacity at Heathrow would also be better for passengers and for jobs than a new hub airport at Stansted or in the Thames Estuary, said the report. Expansion at Heathrow could be delivered around seven years quicker than the time taken to build a new hub airport. Creating a new airport would increase travel times for 90% of hub passengers, with the economic cost of longer journeys amounting to a possible £26 billion. The report said that adding capacity at Heathrow would also be better for taxpayers, with a new airport needing around £25 billion of public money [for roads etc]. More than 76,000 people directly employed at Heathrow would face re-location or redundancy if Heathrow was replaced by a new airport. The report also said that the area around Heathrow in west London was home to 202 of the UK’s top 300 company headquarters. Mayor Boris Johnson is one of the leading supporters of a new Thames Estuary airport and vehemently opposes the building of an extra, third, runway at Heathrow. Labour backed the third runway plan in 2009 but the expansion was scrapped by the coalition Government, which has now set up an Aviation Commission under former CBI chief Sir Howard Davies to look into the whole question of airport capacity. 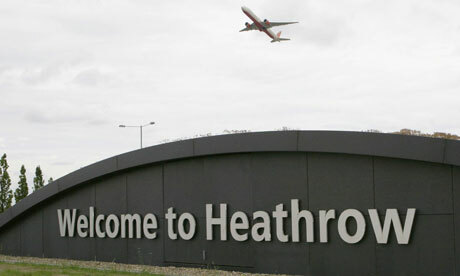 The report has been compiled by Heathrow Airport with architectural and planning consultants AECOM and Quod. It will form part of Heathrow’s submission to the Davies Commission. The commission will publish its interim report by the end of this year and its final report in the summer of 2015. Mr Johnson’s chief adviser on aviation, Daniel Moylan, said: “We need a grown-up debate about the desperate need for new aviation capacity, not scaremongering to serve a vested interest. A four-runway, 24-hour-a-day airport to the east of London would create tens of thousands of new jobs, and businesses and workers would have 12-15 years in which to plan for that opportunity. Heathrow is better located for passengers, business and jobs than a new hub airport at Stansted or in the Thames Estuary according to new analysis published today. The new report, entitled “Best placed for Britain”, says that expanding Heathrow is the quickest way for Britain to get ahead in the global race, connecting the UK to growing markets around the world faster and at less cost to the taxpayer than any other hub option. The report has been compiled by Heathrow Airport with architectural and planning consultants AECOM and Quod, and was commissioned as part of new evidence to present to the Airports Commission under Sir Howard Davies. Best for passengers. Building a new hub airport to the east of London would increase travel times for 90% of hub passengers. Even if a new hub airport came with a major investment in new transport infrastructure, Heathrow would still have 4 million more people within 60 minutes travel time. The economic cost of longer journeys to a new hub could be £26bn net present value – the equivalent to cancelling out all the benefits of reduced journey time delivered by High Speed 2. Best for business and the economy. The area around Heathrow is home to some of the world’s most highly productive business clusters in industries like IT and pharmaceuticals. In total 202 of the UK’s top 300 company HQs are in close proximity to Heathrow. The area has 60% more international businesses, twice as many US businesses, and three and a half times as many Japanese businesses than the national average. Best for local jobs. The 76,600 people directly employed at Heathrow would face re-location or redundancy if Heathrow was replaced by a new airport. Direct job losses would be far greater than those that occurred when the largest single redundancy in the UK took place at Shotton Steel in 1985 and MG Rover closed its factory at Longbridge in 2005 (both 6,500 jobs), or the worst year of pit closures in the UK, 1984 (30,000 jobs). Best for speed of delivery. Additional capacity at Heathrow could be delivered around 7 years more quickly than any new hub airport could be built. Any delay is critical, as the UK is losing some £14bn a year in trade and export earnings due to constraints in aviation hub capacity. Each additional year of delay would see the UK fall further behind European hub competitors in the global race for growth and jobs. Best for taxpayers. Adding capacity at Heathrow will cost the taxpayer much less than building a new hub airport. The report calculates for the first time that £20-£25bn of sunk rail infrastructure cost has been committed around Heathrow since the 1970s. Any new hub would need to build vast new infrastructure from scratch using public money. Mayor of London Boris Johnson estimates that a new hub airport would cost in the region of £70-80 billion of which £25 billion would require public subsidy. The UK Government set up the Airports Commission in 2012 to examine the need for additional UK airport capacity. The Commission is responsible for submitting an interim report to the government by the end of 2013 identifying and recommending options for maintaining the UK’s status as an international hub for aviation. It will submit its final recommendations to government by summer 2015. Capacity is constrained at the UK’s only global hub, Heathrow, which has been virtually full since 2003. Heathrow provides long haul services to direct and transferring passengers. Other UK airports such as Gatwick, Manchester and Birmingham operate a ‘point-to-point’ model, providing a wide range of direct short-haul flights but few long-haul services. Heathrow and the Mayor of London both agree that the UK needs additional capacity at a single major hub airport with the size and scale to compete with other international hub airports such as Frankfurt, Paris and Amsterdam. We only disagree on the question of where this additional capacity should be added – at Heathrow or at a new hub airport to the east of London. In July, we will submit options to the Airports Commission for additional runway capacity at Heathrow and set out environmental impacts. Gatwick has not been included in the report as a potential location for the UK’s hub because it is only proposing a two-runway solution and therefore could not be any larger than Heathrow is today. I never thought Heathrow Ltd would be coughing up for more roads,public transport to cope with the 20 million extra passengers a third runway would bring. Same story, albeit on a smaller scale, at Luton where the operator’s half-baked analysis of the road traffic consequences of its proposed expansion says, in effect, “it’s all too terribly difficult for us to estimate what might be the increase in road traffic at any distance more than a mile or so from the airport, and what proportion of any growth would be caused by airport expansion – so we’ll leave any provision that turns out to be necessary to the public purse”. Posted: Tuesday, June 18th, 2013. Filed in General News, News about Airports, Recent News.